Don’t you love the taste of sweet jam? I certainly do. My favorite is strawberry jam, but I think you probably already guessed that considering all of my recent recipes. Jam on my toast first thing in the morning makes me happy. And I can never go wrong with a peanut butter, jam, and banana sandwich for lunch. If you haven’t had that combination before, you really should. Even better? 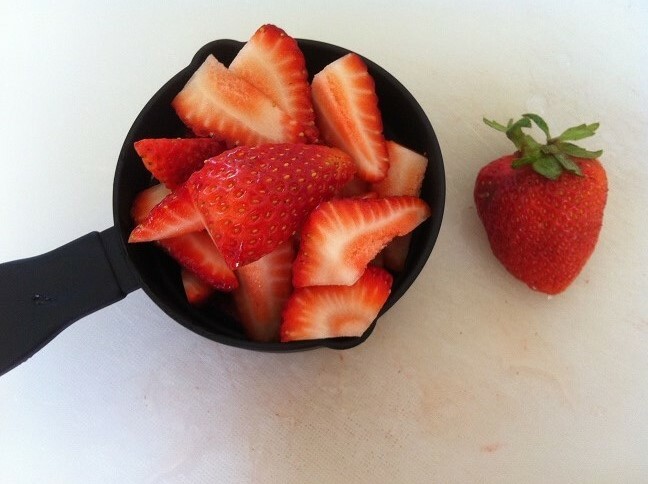 Add strawberries too. If I’m a little hungry, I can always have crackers topped with jam. So addictive. 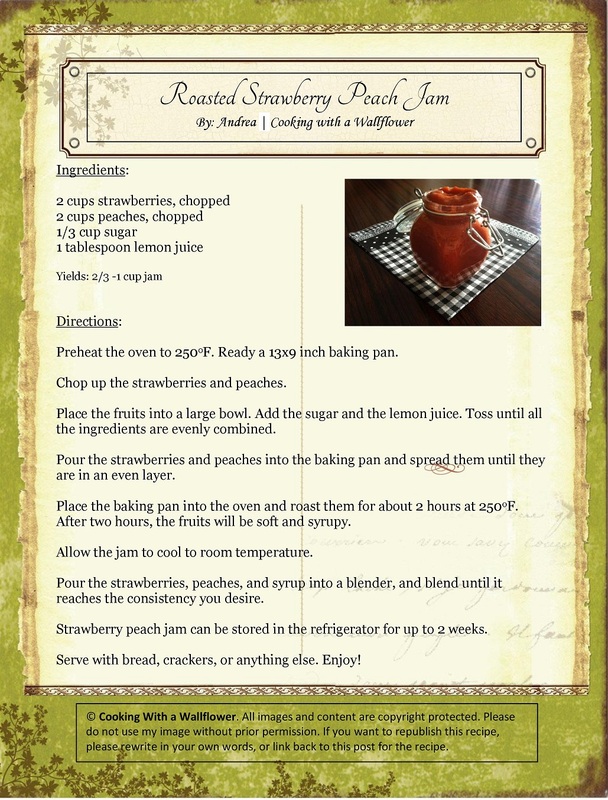 I’ve wanted to make jam for the longest time, but browsing through various recipes, I thought it sounded too much of a bother. I definitely did not want to run out and buy pectin just to make jam. 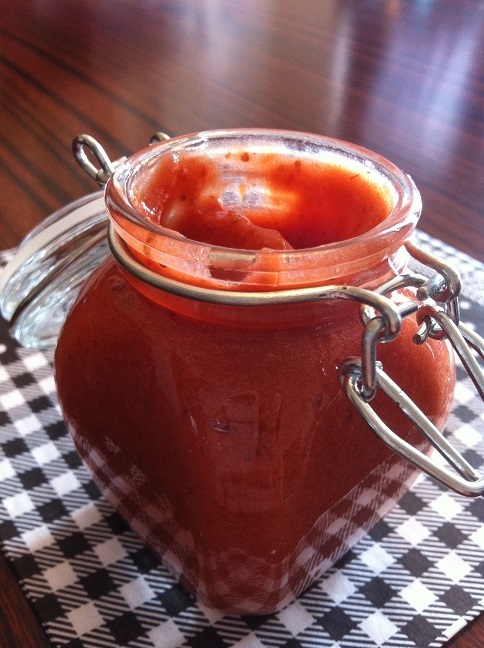 But then I came across a recipe from Kitchen Simplicity for Roasted Strawberry Jam, and I knew, just knew, that I had to make it. So simple with just a few ingredients, and I don’t even have to stand there and watch over it. Sounds perfect to me. I wanted a summery version of this classic jam. 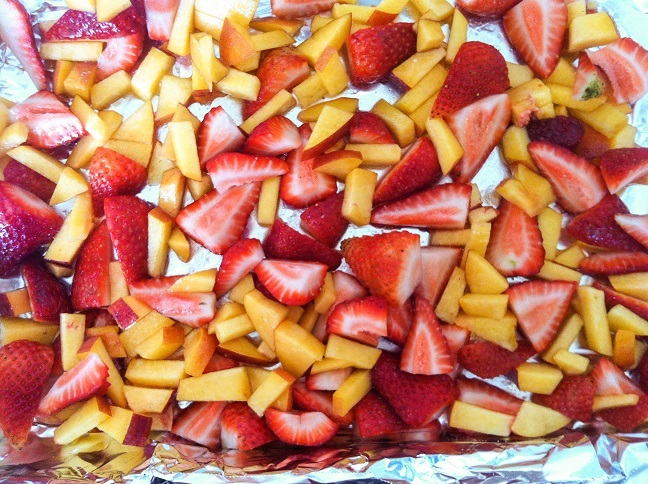 What’s more summery than peaches and strawberries together? Just a few steps and you’ll have the perfect jam to accompany your morning toast, your delicious sandwich, and your afternoon pick me up. First, preheat the oven to 250oF. Set out a 9×13 inch baking pan. If you prefer less of a mess, line it with foil. But only do this if your foil is large enough to cover the entire baking pan. Otherwise, don’t do it. You don’t want to layer the foil because the juice from the fruits will escape and you want to retain as much juice as possible. 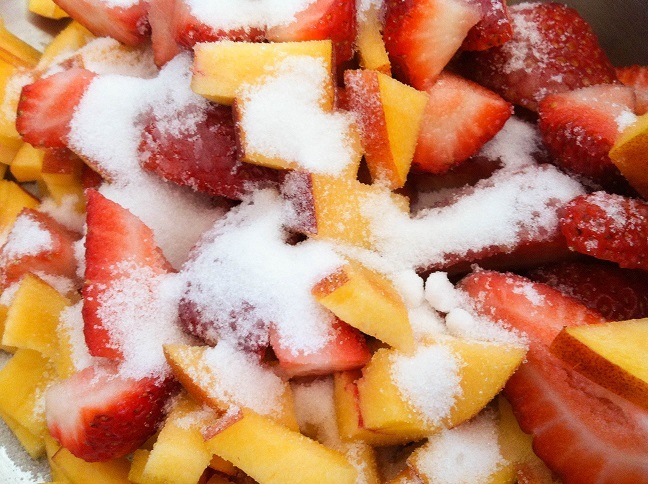 Toss the strawberries and peaches with the lemon juice and sugar. Spread them onto the baking pan evenly. Place the baking pan into the oven and roast for about 2 hours. If you want, you can mix them about an hour in, but it’s not necessary. 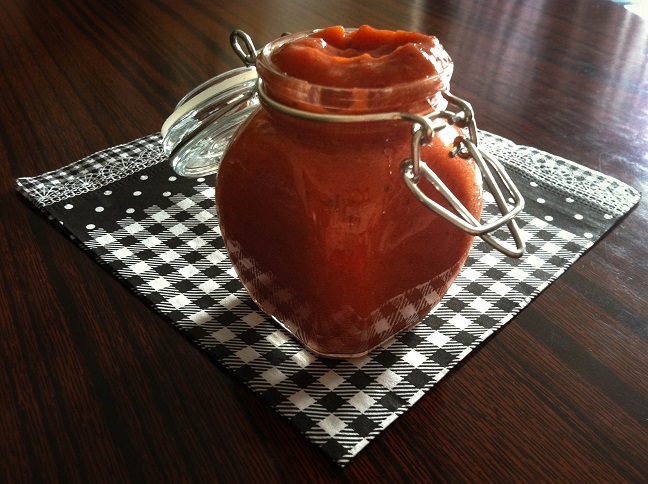 After two hours, the strawberries and peaches will appear soft and syrupy. Allow the jam to cool down to room temperature. 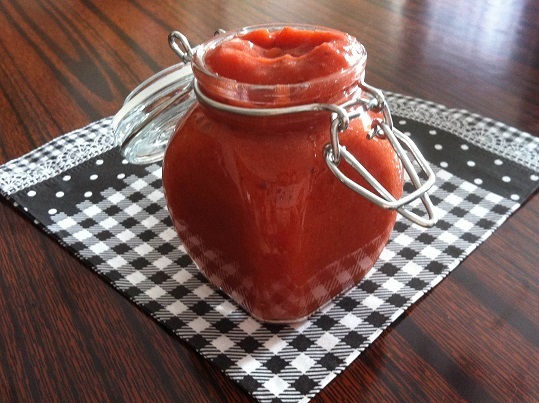 Pour the strawberries, peaches, and syrup into the blender, and blend until the consistency is to your liking. Store the jam in the refrigerator for up to two weeks. Serve with whatever you like. Enjoy! Not fair! It’s strawberry season in southeast Queensland (YES! 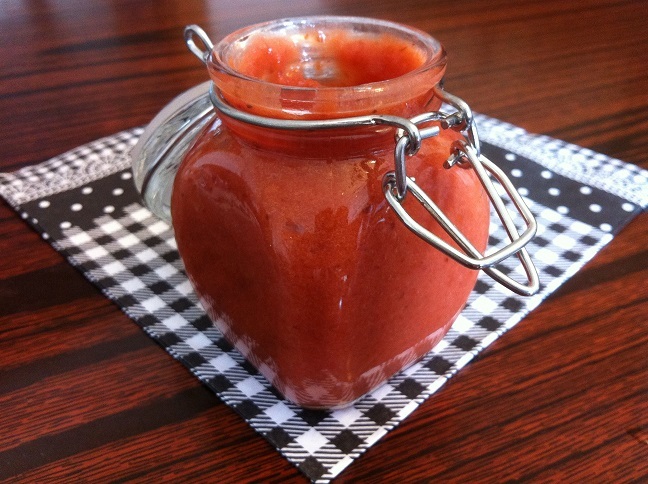 It is Winter) But NO fresh peaches available to try your peach and berry jam. Looks very refreshing. Perfect for summer! I’ll have to try it with lavender next time =) Thanks for the tip! I think it depends on what recipe you use. I thought jam making would be a lot harder too. But it’s the waiting part that takes the longest. That looks delicious. I’ll have to try that when our peaches are in season! I’m sure I will. 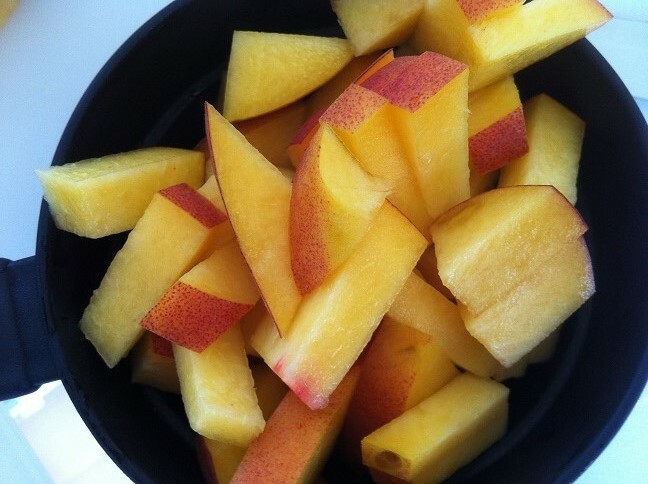 Two of my favorite fruits! Thanks for sharing the recipe! Another must try recipe. You spoil us readers with your great ideas. Thanks for sharing! Some canning recipes call for baking or boiling the glass. What’s your take? Beautiful jam. Beautiful jar. Perfect for giving. I’ve never made jam before but, this makes me want to give it a try! Looks mighty tempting! I like the idea of not having to decide when it has boiled long enough to make regulation “jam”. I always cook it too long, and it is stringy and unpleasant. This is the second recipe I’ve seen lately calling for roasted strawberries. The other one was for ice cream. Just brought home four more pounds of strawberries, so may give your method a quick whirl. I have a couple of nectarines, too, so they could stand in for the peaches, yah? Wow. what a clever idea. I’m hanging out for summer now. Looks delicious – and easy, peasy. I may try when life slows down a bit. Thanks for stopping by. that looks, sounds, and smells delicious. what a brilliant combination. i’ll have to try some. thanks also for liking my blog post. This looks especially decadent! And fun. 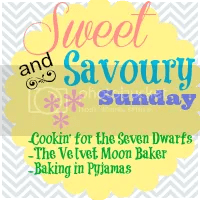 I’m on a sugar restricted diet and can have, as a sweetener, only honey and dried fruit. I could use one, or the other, or both. I wonder how that would turn out. Looks so great! Did you attempt canning any? Would love to know if that worked! This looks lovely. A cup of tea and toast with home-made jam is a great comfort and cure-all for many things, so I will have to add this to my repertoire! And the bestest part Is it’s so quick!! I bet it is delicious and I have to try it. Thank you for sharing.